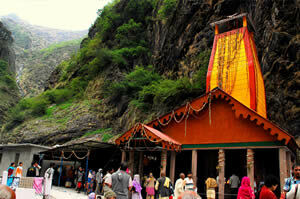 Yamunotri is the source of the Yamuna, a river goddess like the Ganga. She is often depicted as a beautiful woman holding a pot of water and riding a tortoise. Beginning at Yamunotri the river would create her own path across north India to merge into the Ganga at Allahabad. So this became the most sacred prayag of all as a third hidden river, the Saraswati is also said to merge into the Ganga. Allahabad became the site of the giant gathering of the Kumbha Mela. The water from Yamunotri is taken home by pilgrims and used in the worship of Lord Krishna during the festival of Janamashtami. Yamunotri stands at a height of 3185 metres and on the north flank of the Bandarpoonch Mountain. Pilgrims reach Hanuman Chatti from Uttarkashi by road and then trek for 14 km that takes around six hours. As the climb is very steep some pilgrims stay overnight at Janakibai Chatti to get acclimatized to the altitude. There are two prayags on the way. At Hanuman Chatti the Hanuman Ganga meets the Yamuna and the Nil Ganga at Shani Prayag where there is a temple to Shani or Saturn where pilgrims pray to the god who is said to ward off misfortune. Yamuna is the daughter of the sun god Surya and his consort Sanjana and Yama the god of death is her twin brother. Legends say that a sage named Deval had his hermitage here and his daily ritual was to bathe in the Ganga. When the sage became very old and could no longer walk to the Ganga the goddess released a stream that began to flow past the hermitage and this was the Yamuna. The source of the river is the remote Champasar Glacier and nearby is the lake called Saptarishi Kund because seven sages meditated there. These were the rishis – Kashyapa, Atri, Bharadwaj, Viswamitra, Gautama, Jamadagni and Vasishtha. This lake is at a height of 4420 metres in the slopes of the mountain called Kalinda Parvat and is extremely difficult to reach. It is a tough sixteen hour climb from Yamunotri on very steep inclines and few pilgrims attempt it. The temple at Yamunotri was built Sudarshan Shah, the king of Tehri. The temple was later renovated by Rani Guleria a queen of Jaipur. The building was badly damaged by an earthquake in 1991 and needed extensive repairs. The small stone shrine has the images of the two river goddesses Yamuna and Ganga, the first in black marble and the second in white marble. 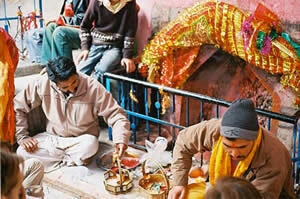 Near the temple is a stone called Divya Shila that is first worshipped before devotees perform puja in the temple. The hot springs appear at the Divya Shila. Many pilgrims stay at Yamunotri for three days of pujas as they believe that it cleanses them of their sins. There are a number of hot springs near the temple and their water is collected in tanks. 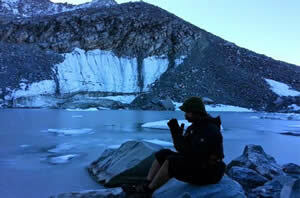 The hottest is called Surya Kund after Yamuna’s father and the water is too hot to bathe in. Pilgrims dip cloth bags of rice and potatoes in the water and it is soon cooked. This is then offered in the temple and consecrated as prasad. Pilgrims bathe in the Yamuna Bai Kund.